"I was confused as to why ... police officers would drive down a road that was in an area that was known for flooding," said the daughter of Nicolette Green. The daughter of a woman who died when the sheriff's van she and another woman were riding in became trapped by Florence floodwaters in South Carolina said Wednesday she doesn’t understand how the accident could have occurred. Rose Hershberger, 19, said she was stunned when she learned that the Horry County Sheriff’s Office van carrying her mother, Nicolette Green, 43, and another woman became trapped Tuesday night. "I was in absolute shock," she said. Green and the other woman in the van, Wendy Newton, 45, did not survive. The two sheriff’s deputies were rescued and placed on administrative leave while the accident is being investigated, the sheriff's office said. Both women have been described by authorities as mental health patients who were being transported from their hospitals near the coast to a behavioral center further inland in the city of Florence. The tropical storm, which had been a hurricane, caused major flooding in parts of the Carolinas. "I was confused as to why someone would, or the police officers would drive down a road that was in an area that was known for flooding,” Hershberger said. "If they saw the water—they have their own, you know, 'turn around, don’t drown.' They have that everywhere,” she said, referring to the slogan used to warn drivers about floodwaters. Officials have warned people not to drive into standing or moving floodwaters in the days since Florence came ashore on the North Carolina coast as a Category 1 hurricane and swamped the Carolinas. They have also said that many fatal victims of hurricanes or tropical storms die by drowning. At least 36 deaths have been blamed on Florence or its aftermath, with most of the deaths in North Carolina. The Horry County Sheriff’s Office said Wednesday that “officers were transporting Green and Newton following involuntary commitments by a physician." Hershberger said her mother was diagnosed with schizophrenia three years ago and was on medication for it. On Tuesday, Green went to a new therapist who determined she needed to be committed to a mental institution. The closest place that would take her insurance was in Darlington, South Carolina, Hershberger said. The incident is being investigated by the State Law Enforcement Division, the sheriff’s office said. A traffic investigation and an internal investigation are also being conducted. "I feel very upset and kind of betrayed, because my mom was a very, very trusting person,” Hershberger said. "And she still put her trust in the deputies that were supposed to take care of her and made sure she got there safely, and the fact that they were able to get out but my mom and the other woman wasn't makes me feel really like hurt and betrayed by them," Hershberger said. Horry County Sheriff Phillip Thompson said Wednesday that the deputies tried to help the patients "for a long period of time," but finally took refuge on top of their vehicle as the waters climbed higher. Thompson said there were barriers on the road, and the van may have gone around them. “Obviously it appears that they did. My question is, I want to know why. What were the circumstances and what happened at that particular time,” he said in a news conference Wednesday night, according to NBC affiliate WMBF of Myrtle Beach. Thompson said the sheriff’s department transported around 1,200 patients last year and has never had anything like this happen, He said the families of the victims were in their prayers. “We’re sorry. We take a lot of pride in what we do. We work hard to protect and to serve our citizens, and we’re just so very sorry that this event has taken place,” he said. 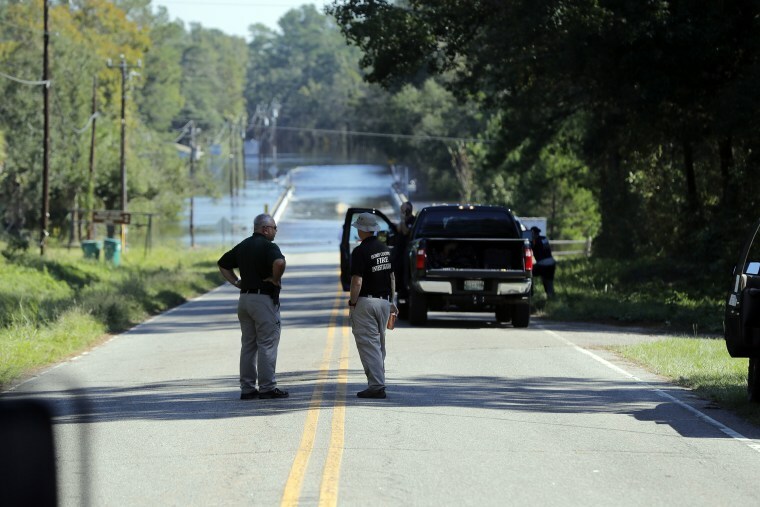 The vehicle was traveling west on Highway 76 from Conway, South Carolina, to Darlington when the van was overtaken by floodwaters about a half-mile from the Little Pee Dee River, the sheriff’s office has said. Hershberger said she expected her mother to go to her appointment and return Tuesday, just like normal. "We were all going to watch movies together,” she said. "... In my head, it's hard for me to accept the fact that my mom is now dead." CORRECTION (Sept. 20, 2018, 6:42 a.m.): An earlier version of this article misstated the name of one of the victims. She was Windy Newton, not Wendy Winston. CORRECTION (Oct. 2, 2018, 3:20 p.m. ET): A previous version of this article misstated the first name of one of the victims. She is Wendy Newton, not Windy, the Marion County coroner said.